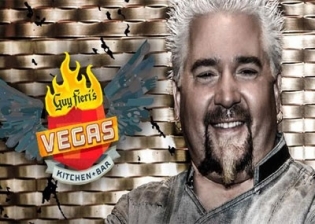 Guy Fieri’s Vegas Kitchen and Bar is garnering rave reviews. Featuring the expected burgers, fries, tacos and wings but with unexpected gourmet twists. The portions are HUGE as is the flavor! There is an outdoor patio to enjoy the people watching and the decor is “Ed Hardy” with a Fieri twist as Guy’s tattoos adorn some of the walls and decor. This is an All-American place with loud music, live TV and great service. The mac and cheese bacon burger is getting crazy good reviews as are the fireball whiskey wings. Don’t forget the fries as they are some of the best around; and if you somehow manage to save room for dessert, you will not be disappointed with any of the fun choices offered. You have to go for the cheesecake challenge! The cocktail menu is fun and there are also 16 craft beers and a frozen tap system shot bar. Be sure to try the Bloody Mary Brunch! If you like big food this is your place! You will be full when you leave. After you eat and waddle out of the restaurant they have a casino bar nearby and you can sit and drink and play some video games. I had lunch here and the food is outstanding but they don’t give you as many fries as they used to and that was rather disappointing. I’m still giving them five stars but disappointed they cut back. If I could give them 4.5 stars I would. I had lunch here on December 12, 2016 and the portions are huge and I left with a very full stomach. I sat at the bar and ate my meal, people working there and the other customers were are very friendly and I’m giving it five stars. I had lunch at the bar on October 24 and it was outstanding. People are very nice the food was excellent and you get rather large portions! The adult beverages are huge too. I ate here in September and November and it was awesome. I had the $19 bacon and macaroni and cheese burger it was nothing short of spectacular. My second trip and I had the bacon burger with mac and cheese on it both times and it’s the best burger I’ve had in Vegas. Portions are huge!! !